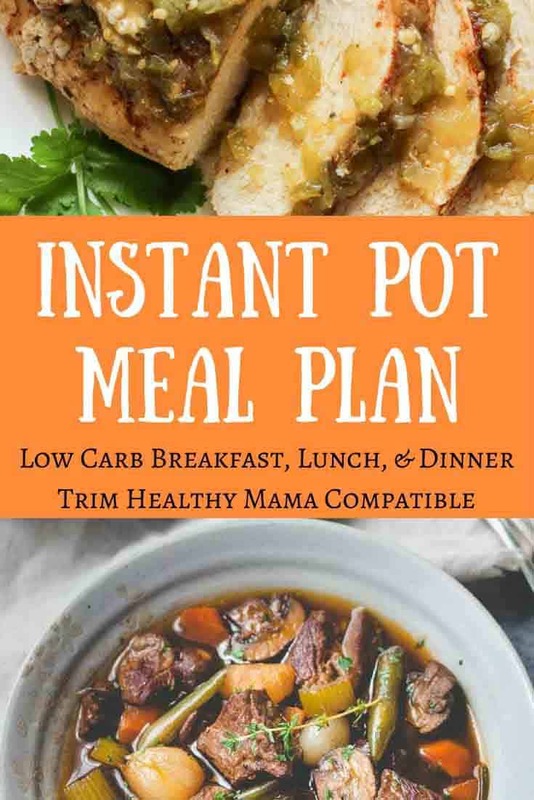 Y’all, I’m so excited to share this low carb Instant Pot meal plan with you! It is one of the absolute best menus in our menu plan rotation: it’s perfect for Trim Healthy Mamas (and low-carb lovers) and their families. It’s no secret to anyone who knows me that I absolutely adore my Instant Pot. I’ve actually taken it on vacation with me. And it’s also no secret that Trim Healthy Mama is my favorite way to eat. The Instant Pot saves time and effort, plus makes amazing food in a fraction of the time. What’s not to love? Now, it should be noted that while all the dinners are low-carb and made in the Instant Pot, some of the side dishes are not because growing kids and hard-working husbands just need stick-to-your-rib dinners. About half of our breakfasts and lunches are also made in the Instant Pot, but the rest are leftovers or something else pretty easy. That’s the beauty of this low carb Instant Pot meal plan; it’s so easy and delicious that everyone in the house (and your guests!) will enjoy it. Bon Appetit! If you’re looking for strictly low-carb ideas for all, ignore the tweaks & suggestions added for families not on a specific eating plan and just stick with the low-carb portions. But kids and hubbies seem to really need those carbs as do pregnant and nursing mamas, so I’ve added a few energizing breakfast options that you could work in. If you’re a THM you need to make sure you have a few “E” meals in your week, so use those breakfast options! 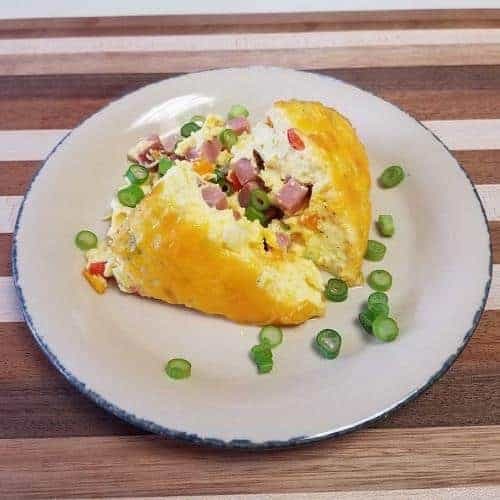 Western Omelette Quiche (quiche in the pressure cooker; how cool is that?! And you can make single serve ramekins or a casserole for everyone to share) When I make this for my hubby and kids, I often include a homemade muffin and some fruit slices. Greek Yogurt (and this recipe is super easy to follow!) **If you’re a THM, this is a great way to get those easy to overlook, but ever important “E” fuel in! The kids like to have yogurt topped with granola, fruit slice hard-boiled boiled eggs for breakfast a few days a week, too, so it’s a breakfast we all enjoy. I also like to mix in some Ranch seasoning and use as a veggie dip for a snack. Steel Cut Oats I make these for the kids a lot, or some variation thereof (we just enjoyed Pumpkin Pie inspired oats this morning) and if I need an extra “E” boost this week, I’ll enjoy these, too. Creamy Salsa Chicken Bowls (I’ll make this up once and have it 4 days for lunch this week, just for ease of planning and because my kids usually eat sandwiches, pasta, or various rice bowls). 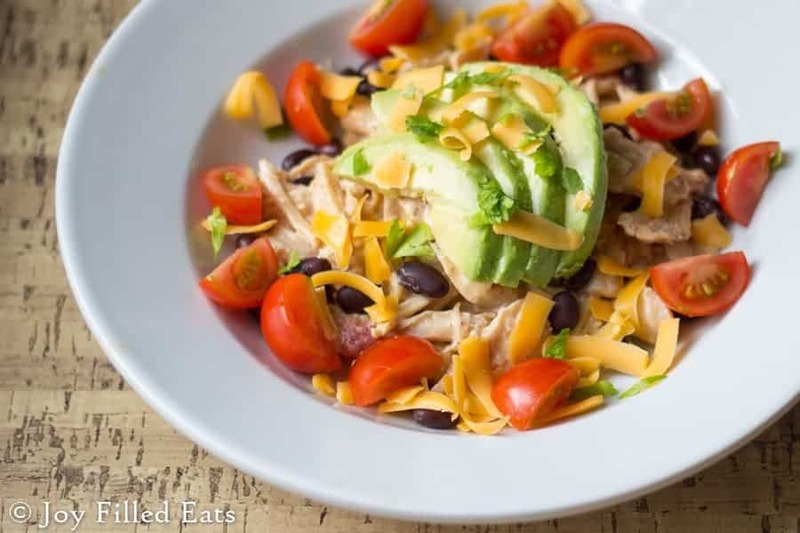 Salad with shredded chicken breast: This is so easy! Just cook your chicken breast in the Instant Pot (I don’t season mine at all and just some mineral salt and pepper when I serve, but you could add whatever you want) and shred it up and put it in a container in the fridge to add to salads all week long. For an “S” salad, you could add bacon and cheese and use a creamy dressing made out of your Greek yogurt. For a “FP”, use a little lemon juice on the salad and just load it up with veggies and the white meat with some salt and pepper. Make chicken tacos and let them load up the tortilla with lettuce, tomato, cheese, sour cream (all things you could have in an “S” treat, too, if you bought the right wraps) and serve with some rice and beans on the side (don’t have these, or you’ll crossover or be in “E” territory). These black beans are awesome mixed into brown rice and my kids enjoy them! We’ll also serve sandwiches or pasta the days they don’t eat what Mama does, and that’s okay! 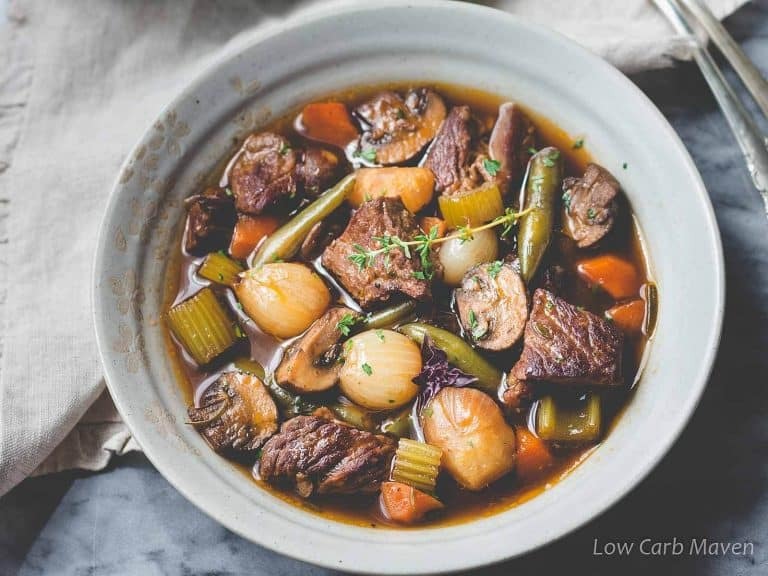 Low Carb Instant Pot Beef Stew This is delicious as a stand-alone, or you can “beef it up” with some baked potatoes for the hubby and kids. Salsa Verde Chicken (THM FP) served with a crisp garden salad to keep it nice and low-carb. **If you’re following the THM plan, take this opportunity to have some brown rice or fluffy quinoa also made in the Instant Pot here to pull this into “E” territory, OR have some fruit for dessert (I’m thinking a grilled peach or some cooked apples and cinnamon). The kids and hubby will enjoy some baked sweet potatoes on the side (also made in the Instant Pot; too cool!). Chicken Cordon Bleu Cups (these are made in individual mason jars – super cool!). Serve with a garden salad or some cooked and buttered veggies. Meatball Minestrone Soup (THM E) (If you’re on a strict low-carb eating plan, adjust your veggies to reflect that; this soup is very versatile). Serve with crusty bread for those who will enjoy it, and for the low-carb/THMer you can enjoy your Bread-in-a-Mug. Meatloaf (how cool is it that you can make this in the IP!?). I’ll top ours with some marinara and a sprinkle of parmesan for some Italian flare. I’ll serve it up with some pasta for hubby and the kids, and we’ll all enjoy a nice garden salad.